I was informed that it will soon be stocked at Jumia.co.ke. The last time I checked it was not available but you can purchase it from Megorgeous.nl as it offers worldwide shipping. I used Sunsera black seed hair oil to seal my hair cuticles after moisturizing my hair and the hair did feel smoother and looks shinier. I can therefore say that it improves hair texture. Scientists at the University of Rome verified the effectiveness of black seed oil which is also known as or black cumin or kalonji in treating hair loss when they conducted a study with patients with telogen effluvium which is a type of hair loss. In this study, half the participants massaged their scalps daily with a lotion containing 0.5% Nigella Sativa for 3 months and the other half used a placebo. 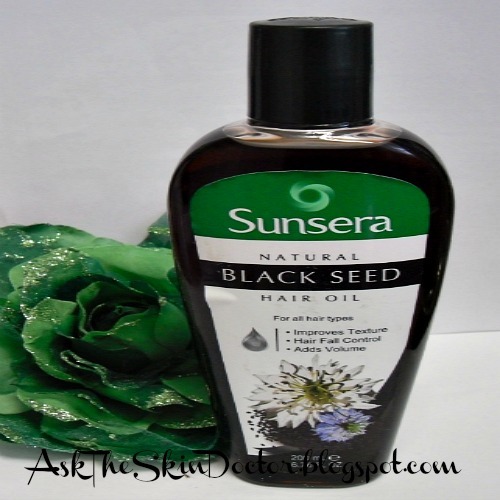 70% of the black seed hair oil group were noted to have significant improvement of their hair density and hair thickness. However, one of its best known uses is that of treating hair loss. Traditionally black seed oil was applied to the bald spots after they had been massaged with a lemon or lime juice. It was left on for 30 minutes before being washed off. 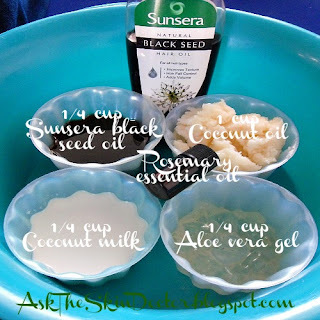 This oil was also mixed with double its amount (e.g 1 cup black seed oil and 2 cups coconut oil) and applied to the scalp for 30 minutes before being washed off to prevent hair loss. The oil from the seeds of this miracle herb was mixed with olive oil and mehandi powder to form a paste for clearing dandruff. It was also used to treat fungal infections of the skin after the area has been cleaned with vinegar. produce an oil which has been used for centuries to treat a wide range of conditions that include high blood pressure, diarrhea, arthritis and anorexia (loss of appetite). I mixed all the ingredients by hand and got this creamy conditioner that I left my hair soft and supple. Chapatis made from whole wheat flour like Atta, are complex carbohydrates which do not cause rapid rises and drastic drops in blood sugar levels after they are consumed. They are also are good sources of the B complex vitamins and minerals like zinc and copper. 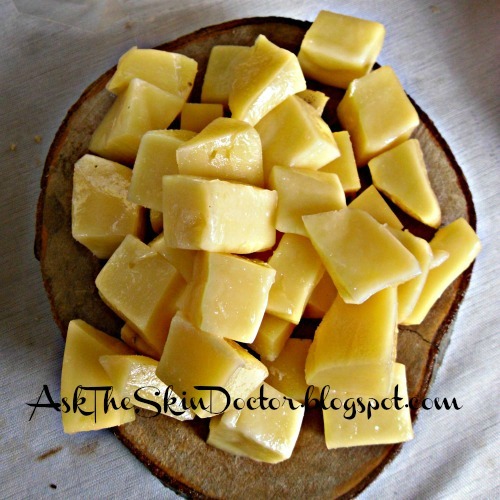 Cheese is a good source of calcium which is a vital mineral for healthy bones. It also contains tryptophan which helps increase levels of serotonin which is the compound that gives a person a sense of emotional well-being. 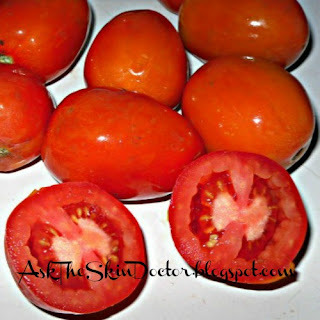 Tomatoes are good sources of vitamin C which is used to make collagen which is required for wound healing and helping the skin maintain skin that appears youthful. Vitamin C is also an antioxidant which prevents premature aging. Tomatoes also contain quercetin which works like a natural antihistamine. 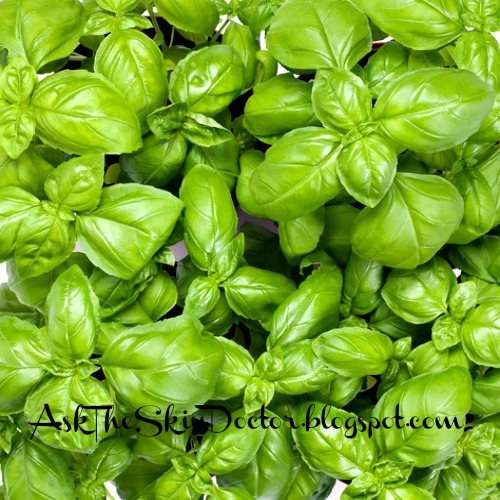 Basil has anti-inflammatory properties. It is also a powerful antioxidant which protects cells in the body from damage by free radicals. 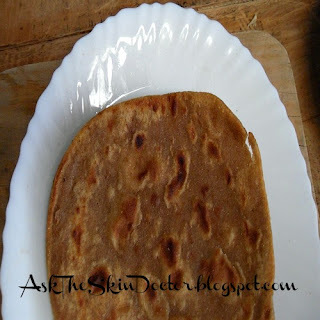 Pick a chapati which is 1 day old and slightly hard as it is the best one to hold the other ingredients. 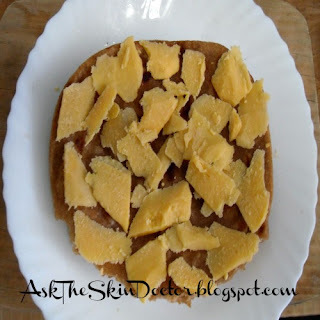 Cover your chapati with cheese. I love cheese and so I use it liberally. Place the tomato rings on top of the cheese. Sprinkle your herbs on top of the cheese. 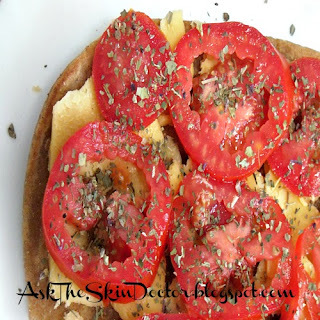 Grate some cheese over the tomatoes. Microwave it on high for 1 1/2 to 2 minutes. Remove from the microwave, let it cool and enjoy. 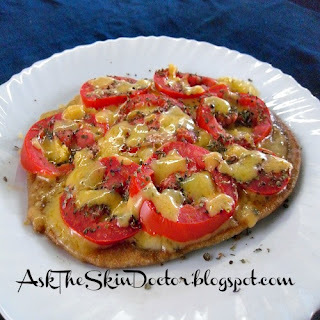 How do you make your chapati pizzas? I liked the full size bar that I bought and reviewed here so much that I went and bought the sample sizes to try out all the scents they had. A hard to describe scent, not the typical rosemary as it is somewhat floral, though quite faint. A barely perceptible scent which I would recommend for the men who do not want to walk around smelling like a flower. This is my favorite scent - a delicate floral that I absolutely love. Not listed as these were sample sizes of just 20 grams each. 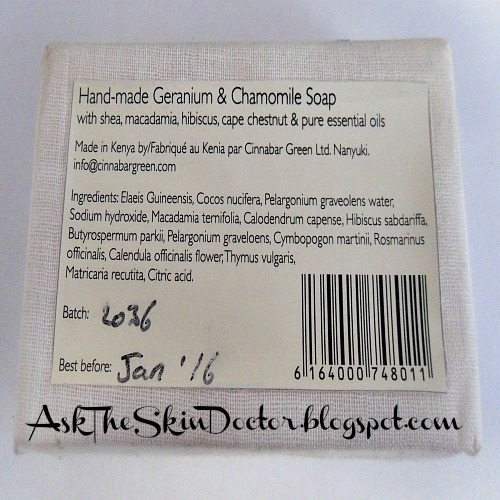 However you can read the ingredients of the full size Geranium and Chamomile review here. Each samples size of 20 grams was Ksh 50 ($ 0.70). These sample sizes were packed in a brown paper bag. I generally like sample sizes because you have very little to lose if you do not like the product. 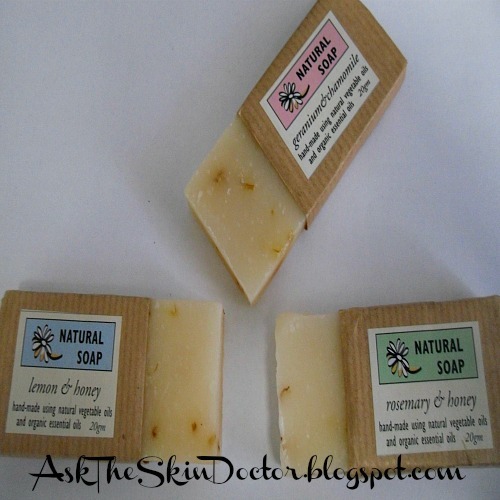 However in this case I lost nothing because I liked all the three trial size soaps. My favorite is the geranium and chamomile. 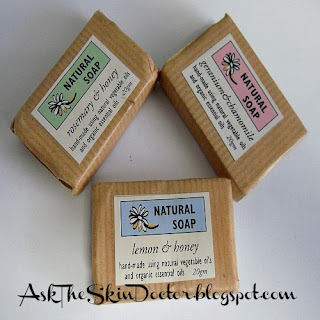 I really, really love handmade soap. In addition, I also love making soap and I am a self-declared handmade soap connoisseur. 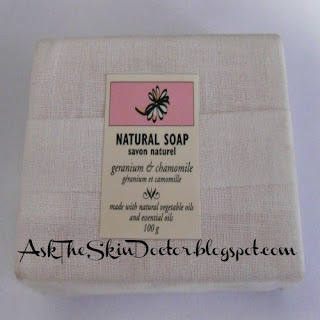 So, when I popped into a pharmacy and saw this bar of soap on display, I just had to buy it and try it; and now that I have a blog, review it. Elaeis guineensis, Cocos nucifera, Pelargonium graveolens water, Sodium hydroxide, Macadamia ternifolia, Calodendrum capense, Hibiscus sabdariffa, Butyrospermum parkii, Pelargonium graveloens, Cymbopogon martinii, Rosmarinus officinalis, Calendula officinalis flower, Thymus vulgaris, Matricaria recitita, Citric acid. African palm oil, Coconut oil, Geranium flower water, Lye, Macadamia seed oil, Cape chestnut, Hibiscus/Roselle, Shea butter, Geranium essential oil, Palmarosa essential oil, Rosemary essential oil, Calendula flower, Thyme essential oil, German chamomile essential oil, Vitamin C.
I really cannot remember the actual price very well since it was something I added onto my other purchases but I am pretty certain it was in this price range. 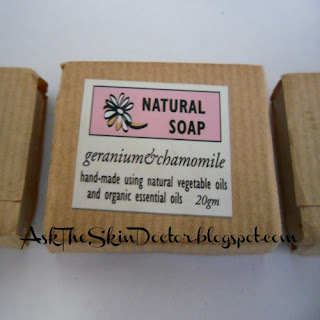 I bought it at Neem Pharmacy in Nairobi. 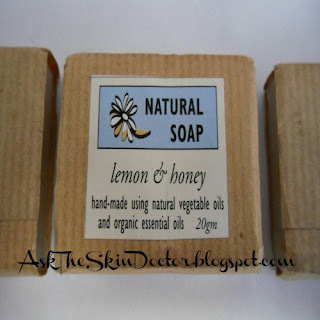 From the moment I set my eyes on this soap it was love at first sight (with yet another bar of handmade soap). 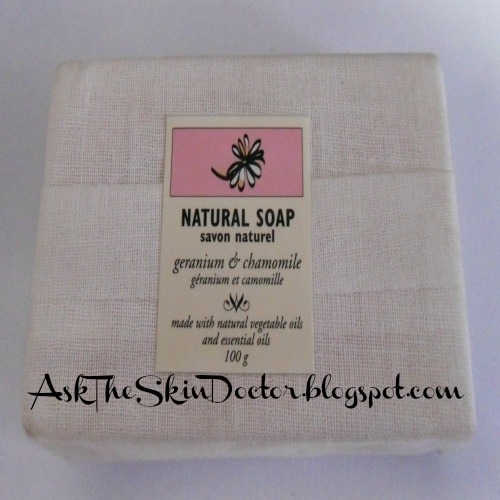 This soap comes wrapped in a white, cotton cloth which gives it a pure, organic look. Its delicate scent also permeates through the cotton to greet your nose with flowery notes. The soap is double wrapped with a light grease-proof paper inside its cloth coat. This helps keep the soap free from dust and also helps it retain its soft scent. After unwrapping what greets you is this majestic bar of handmade purity. 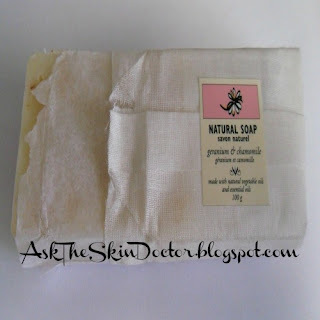 This natural soap lathers pretty well. It also did a good job cleaning my skin and did not dry it. Its has a lovely floral scent from its geranium and chamomile essential oils which I would describe as "a delicate floral". 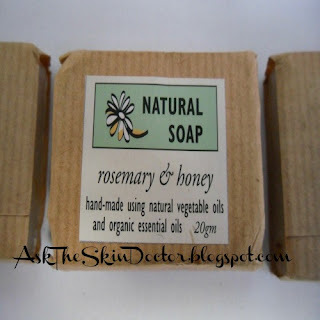 What amazed me is that its delicate scent lingers for a pretty long time compared to other handmade soaps that I have used. 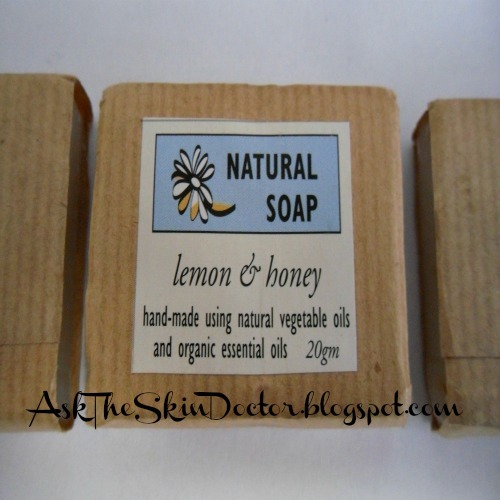 I also think it has a really great price for such a good bar of handmade soap considering all the effort that goes into making one (and I am speaking from experience). 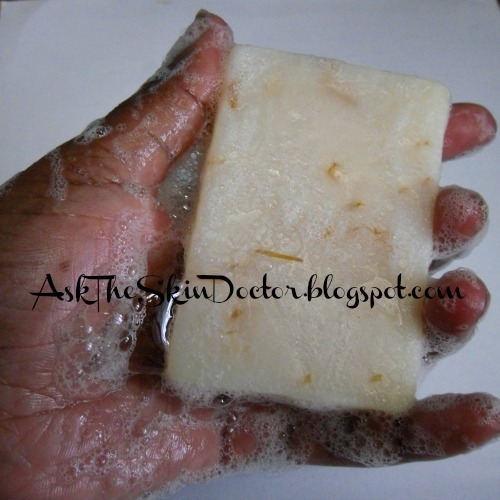 All in all, I liked the packaging, the look, feel and scent of the soap and the way it cleaned my skin. Dear Skin Doctor, what can I do to prevent acne scars? 1. 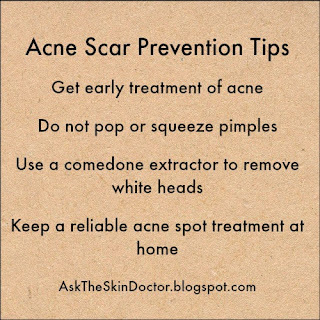 Do not pop or squeeze pimples. This increases the inflammation and increases the chances of forming big scars. 2. Use a comedone extractor to get rid of white heads. This is a much better option than squeezing the pimples. 3. Consult a skin doctor and get acne treated as soon as you notice a small pimple rather than wait for it to become a cyst. 4. 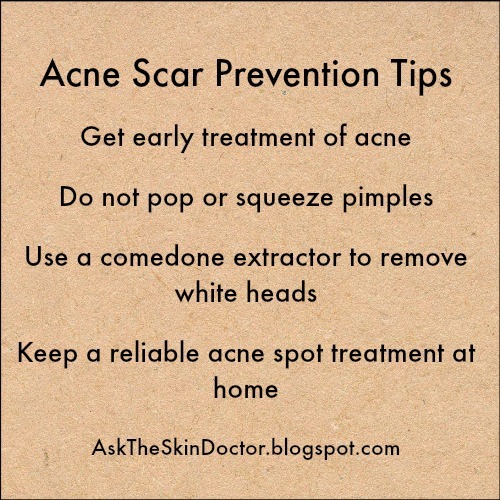 Keep a reliable acne spot treatment at home so that you have something to zap the zits as soon as they begin. A good example is Neutrogena Acne Spot Treatment. 5. 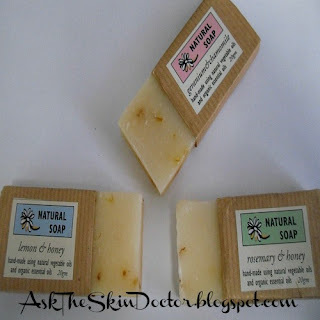 Do not use harsh skin care products on your face like deodorant body soaps or face scrubs with rough bits since they can irritate the skin and increase the inflammation. 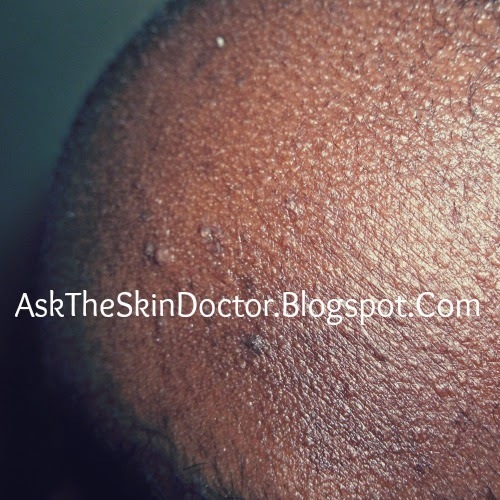 Dear Doctor, what skin care tips can you give a person with acne? Wash your skin to remove the oil and dirt which contribute to clogging the skin pores twice a day, once in the morning and again in the evening. When washing your face do it gently with your fingertips and do not scrub it with a rough wash cloth. Use a cleanser that contains acne treatment ingredients like benzoyl peroxide or salicylic acid. Examples include Clean and Clear Acne Cleanser which contains 10% benzoyl peroxide and Neutrogena Oil-free Acne Wash which contains salicylic acid. Apply an oil free, noncomedogenic (will not clog the skin pores) moisturizer that contains acne treatment ingredients like salicylic acid to your skin twice a day after washing. 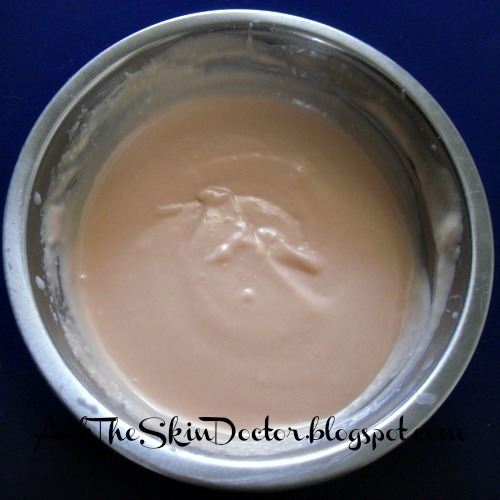 A good example is Clean and Clear Oil Free Moisturizer with 0.5% Salicylic Acid. 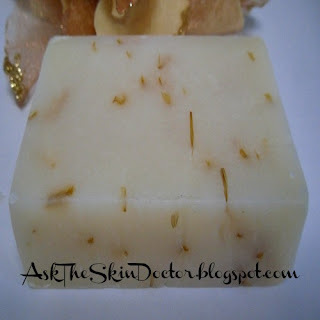 If you have combination skin and develop breakouts in your T-zone (i.e. the forehead and around the nose and chin), apply a gel based moisturizer for the oily part and a lotion for the dry parts. If your entire face is oily you can also use two moisturizers, one for day time with sun protection factors (SPF) and another one for the night with acne controlling ingredients. Cleanse your face and shower with a body wash that contains salicylic acid immediately after working out. Use natural fruit acids to exfoliate or remove the dead cells on the skin's surface since this can help unblock the pores. Examples include the alpha hydroxyl acids (AHAs) like glycolic acid. Break the habit of squeezing and picking pimples by using a comedone extractor since it helps prevent the development of large acne scars. This vital acne tool is available in many beauty shops in Kenya. Use water based makeup that is also noncomedogenic. If possible use makeup which also contains ingredients like salicylic acid and sulfur as these help control acne. Wash your brushes frequently with a mild facial cleanser and leave them to air dry. In addition, replace the sponges regularly to avoid spreading bacteria. If possible, apply your makeup with clean cotton wool balls that you can dispose after a single use. Keep your hair off your face by avoiding fringes since the oils from greasy hair products can also clog the skin pores on the face. Mobile phones can harbor a lot of germs and transfer them to the face when one is chatting. Therefore wipe your phones with antibacterial wipes. Wash your pillow cases weekly to avoid reapplying the oils from your hair on your face as you sleep. Dear Skin Doctor, I am a man in my 20s and I get a little acne on the forehead. I do not want to use prescription medications. Is there any proven alternative medicine for acne? 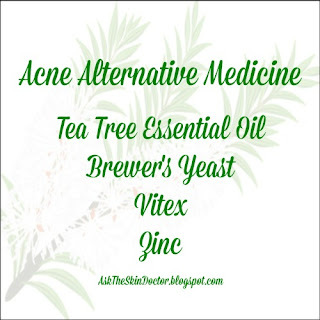 Tea tree essential oil (Melaleuca alternifolia) is proven alternative medicine for acne. 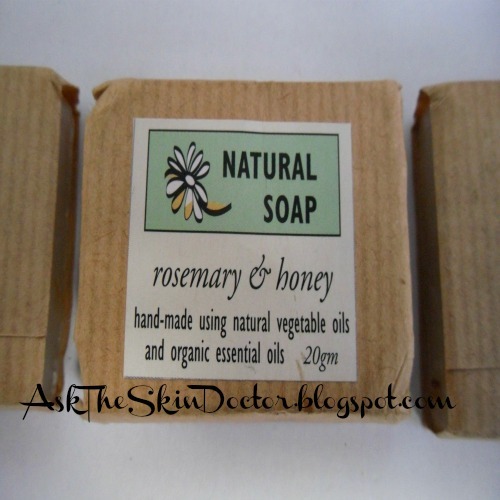 This aromatherapy oil has natural antiseptic properties which are useful for controlling Propionibacterium acne which is the bacteria that is associated with acne. 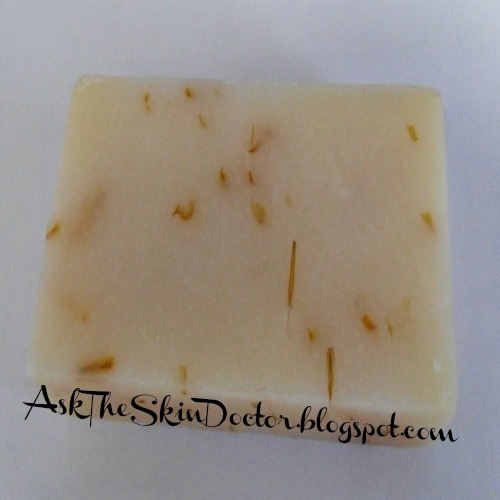 A study proved that tea tree gel was effective for treating mild to moderate acne. In fact, it was shown to work just as well as 5% benzoyl peroxide by reducing the acne lesions after 3 months. The down side was that the tea tree essential oil gel took longer to work but it had less of the side effects experienced after using benzoyl peroxide like dryness of the skin, itchiness and a burning sensation. You can make your own acne aromatherapy gel by mixing 2.5 ml of tea tree essential oil with 47.5 ml of aloe vera gel which you can buy from supermarkets and health stores in Kenya. Store your natural acne treatment products with tea tree essential oil in a dark container and keep it in a cool place since light and heat makes essential oils less effective. Tea tree essential oil should not be used by persons with breast cancer or risk factors for breast cancer (men also get breast cancer). Persons with other hormonal tumors like cancer of the ovary and uterus, or high risk factors for developing them, should also not use tea tree essential oil since it has estrogen-like effects in the body. Women with endometriosis, fibroids and other hormone dependent conditions should also avoid using this essential oil. Once you make your acne treatment tea tree gel, apply it to a small area on the inside of your elbow and bandage it. Wait for 24 hours to see if you will develop itchiness, redness, rashes or any other signs of an allergic reaction before you apply it on your face. Some studies suggest that zinc can reduce the inflammation that is associated with acne as well as the pimples and cysts. Others have even shown zinc deficiency in persons with acne. Though zinc supplements are readily available, I recommend increasing your intake of zinc rich foods like beef, chicken, whole grains, dried beans, wheat germ and nuts. This is due to the fact that zinc toxicity can cause serious complications like copper deficiency in the body. 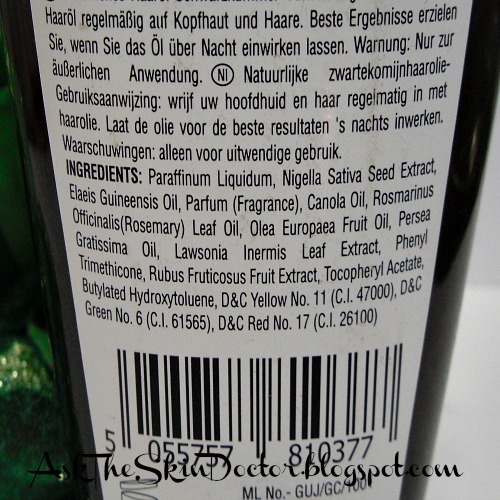 Vitex is one of the acne treatments that have been approved by the German Commission E which is the agency that studies and approves herbal remedies in Germany. This whole fruit extract is recommended for treating the acne that develops before the monthly menstrual periods. It is thought to reduce estrogen and increase progesterone levels by working at the pituitary level in the brain. It should not be taken by pregnant women or those who are breastfeeding. Brewer’s yeast is also recommended by the German Commission E for the treatment of acne due to its antimicrobial effects. This site offers general information and not specific medical advice for your condition. The reader therefore takes full responsibility for any consequences that may arise from using this information. The submitter of free consultation questions and pictures to this site gives me permission to use them. For the most important disclaimer on this site read the "About Me" page.